You can use Connect Four for review purposes with no extra preparation. Divide your class into two groups (as in most teaching situations, the smaller the class the better) and set them on opposite sides of the room with the Connect Four board in between them. Begin your review session by asking a team a question. If that team is correct, they get to place a checker in the slot. If they are wrong, the other team can make a move. This does put a lot of pressure on students to come up with the right answer, so it is probably a good idea to not single out a particular student to provide the answer. Instead, make it a team effort. Each round ends rather quickly, so it is fast paced and no one gets bored. And everyone is reviewing. 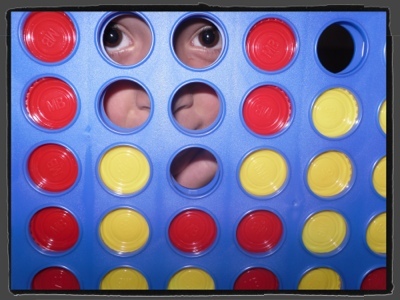 My 9-year-old, “Tweedle Ian”, during a game of Connect Four. How can I resist those big brown eyes?